1667~1668: elder brother of the wakashugata actor Yamakawa Tamura, he started his career in Edo. His first stage name was Yamakawa Naiki. 11th lunar month of 1673: Naiki was invited  to perform at the Edo mansion of the daimyô Matsudaira Yamato-no-Kami . 11th lunar month of 1676: Naiki performed at the Moritaza. 8th lunar month of 1679: Naiki was invited  to perform at the Edo mansion of the daimyô Matsudaira Yamato-no-Kami . 1686: he went to Kyôto to perform as a wakashugata. He took in Kyôto the name of Yamakawa Hikozaemon. 1st lunar month of 1693: Hikozaemon was recorded in the illustrated book "Kokon Shibai Irokurabe Hyakunin Isshu". 1694: Hikozaemon performed at the Moritaza. 1694 ~ 1695: he performed in Kyôto under the name of Naiki Hikozaemon. 1695: he took back the name of Yamakawa Hikozaemon and performed at the Moritaza. No record afterwards. Yamakawa Hikozaemon was a 17th century Kabuki performer, who was active from the 1660s to the 1690s. He excelled in jitsugoto, yatsushigoto and in dances in the tanzen style. He was also a very good handôyatsushi. He was also a talented musician. Along with Abura Kanroku, Yamamoto Katsunojô, Somekawa Ruinosuke, Morii Kokan, Shinozuka Hanbê, Akashi Buhê, Tajima Kizaemon, Tanigawa Yohê, Sugiyama Hanzaemon and others. Along with Matsumoto Tsurunojô, Dekijima Yukie, Matsumoto Rokusaburô, Dekijima Mondo, Kokon Kurojirô, Araki Buhê, Sakon Sabê, Akashi Buhê, Yamamoto Jûjirô, Shiten Magotarô and others. 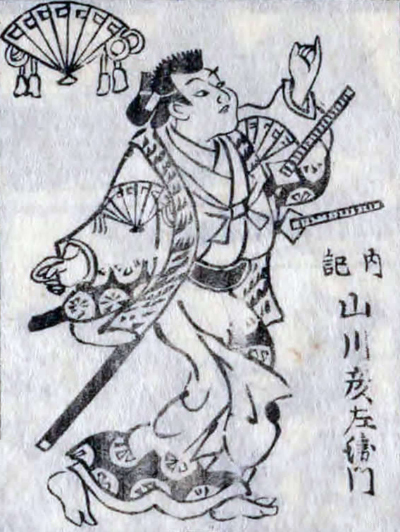 Yamakawa Hikozaemon in an ilustration from the book "Hana no Edo Kabuki Nendaiki"